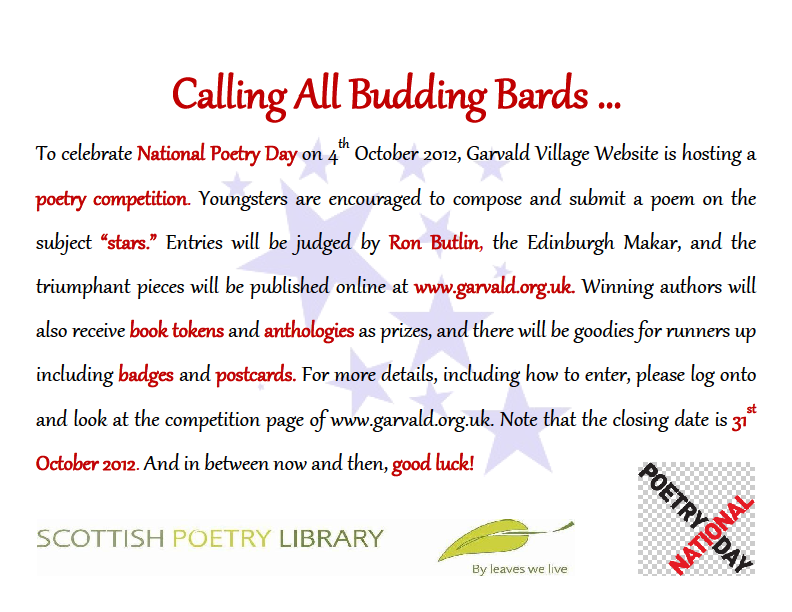 To celebrate National Poetry Day 2012, we’re hosting a poetry competition – woohoo! Youngsters are encouraged to compose a poem on the subject “stars.” Each composition must be a maximum of 25 lines long, and have a title. 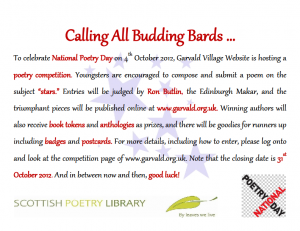 Entries will be judged by Ron Butlin, the Edinburgh Makar. There will be three categories – 5-8, 9-12 and teenagers – and judging will be done anonymously. The three triumphant pieces will be published here at www.garvald.org.uk. Winning authors will also receive book tokens and anthologies as prizes, and there will be goodies for runners up including badges and postcards. It is easy to enter. Either e-mail us your poem or use the contact us page. All entries must be accompanied with the following information: name; age; and snail- and e-mail address. Handwritten entries will also be accepted from younger entrants. Please pop them in the postbox at The Rowans in Garvald, but remember to put contact details on the reverse. The closing date is 31st October 2012. The winners will be announced in early December, and prizes presented thereafter. For full details of the competition, click here. Good luck! This entry was posted in Website News on August 29, 2012 by KM.